With new STM technology does Canon’s updated 18-135mm still deliver? 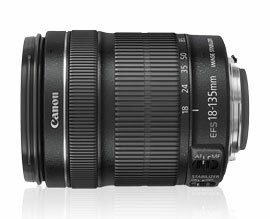 Launched in June 2012 the Canon EF-S 18-135mm f3.5-f5.6 IS STM is an updated version of Canon’s Super Zoom ‘kit’ lens originally announced in 2009 alongside the Canon EOS 7D DSLR. Designed for the Canon EF-S lens mount on Canon DSLRs using an APS-C sensor EF-S lenses aren’t compatible with Canon full-frame cameras like the EOS 1Dx. On APS-C cameras however taking account of the 1.6x Canon ‘crop factor’ the 18–135mm focal length offers an equivalent range of 29 – 216mm in 35mm terms, which makes it a versatile all-in-one lens for travel and general use photography. Aimed at the enthusiast market the 18-135mm f/3.5 – f/5.6 IS STM features a variable maximum aperture, which lets less light through the aperture as the lens is zoomed in. This keeps the cost down but at the longest focal length of 135mm the f/5.6 aperture lets in 4-times less light than f/2.8 on a pro lens. The new lens does however feature Canon’s lens-based Image Stabilisation system, known as IS, which the manufacturer states offers 4-stops of anti-shake performance and to some degree this makes up for the variable maximum aperture. The main development however is the inclusion of Canon’s latest evolution in autofocus technology, known as the Stepper Motor or STM Technology. Until now only available on the Canon EF 40mm f/2.8 STM lens, STM technology brings ultra quiet operation for continuous autofocus during video capture. With both lenses currently available however if you’re not interested in the Stepper Motor, which lens should you go for? We delve under the hood of the DxOMark Lens Metric Scores for the Canon EF-S 18-135mm f3.5-f5.6 IS STM to answer those questions for you. The overall DxOMark Score of 12 for the Canon EF-S 18-135mm f3.5-f5.6 IS STM is, like its predecessor, an excellent Super Zoom contender and offers good optical quality for a wide range of subjects. With a DxOMark Lens Metric Score of 7 P-Mpix for Sharpness, when tested on a Canon EOS 7D, the Canon EF-S 18-135mm f/3.5 – f/5.6 IS STM is in fact the sharpest Super Zoom we’ve tested. Compared to much of the competition its sharpness is excellent, for example although the Sigma 18-250mm F3.5-6.3 DC MACRO OS HSM is a good example of a Super Zoom it only manages 5.6P-Mpix for sharpness, a significant difference. Make sure you look back for a full review on the Sigma 18-250mm F3.5-6.3 DC MACRO OS HSM Canon soon. Despite being the sharpest lens in the super zoom category this type of lens are not the best optically. The wide focal range available in a relatively small package makes them convenient for everyday use but maintaining good sharpness across the focal range is a challenge. Between 18 – 70mm using wide apertures like f/5.6 results are respectable and the Canon EF-S 18-135mm f3.5-f5.6 IS STM is at its sharpest at 18mm f/5.6. Results at the longer end of the focal range aren’t too bad either when using apertures between f/5.6 and f/11, but once you close down the aperture to f/11 and beyond sharpness suffers. On a brighter note lens vignetting, the effect of shading towards the edges of the frame, is remarkably well controlled for a lens of this type and across the board the results are excellent. Shooting at apertures of f/5.6 and smaller the effect has been eliminated and although it’s at its most pronounced at 18mm f/3.5 this is to be expected at such settings. There’s some vignetting at 135mm f/5.6 too but again it’s minor and with the aperture closed down to f/8 the problem is eradicated at all focal lengths. Chromatic Aberration, the appearance of coloured lines along contrast edges, is an issue for Super Zooms and results from the Canon EF-S 18-135mm f3.5-f5.6 IS STM are mixed. Between 18 – 35mm at all apertures the effect is noticeable with images requiring some correction in software and the effect is at its worst between 24 – 35mm. The longer end of the focal range performs much better however with the best performance 50 – 115mm and although there’s some evidence of vignetting at 135mm it’s controlled much better. One of the weakest aspects of the Canon EF-S 18-135mm f3.5-f5.6 IS STM optical quality is Distortion, which is too strong at all focal lengths to be acceptable and requires postproduction correction. At 18mm barrel distortion occurs but this quickly turns into pin-cushion at 24mm and this continues at all focal lengths becoming its most pronounced at 135mm. So despite a few optical niggles than can be correct in software we’ve seen the Canon EF-S 18-135mm f3.5-f5.6 IS STM is excellent for a Super Zoom, but how does it compare to its predecessor? Well the results are very close with the new lens achieving a DxOMark Score of 12 compared to 11 on the old lens and in effect they offer the same optical quality. All Lens Metric Scores with the exception of Distortion have been improved very slightly but a less than 10% improvement on the DxOMark Scores means in reality no discernable improvement has been made. With the new STM version Canon has made tiny improvements to what was already a very good lens. Ideally all in one lenses such as these will deliver at all settings but in reality zooms inherently have strong and weak points and it’s helpful to know what they are. In terms of image sharpness the new version performs marginally better at 18mm f/3.5, but from f/4 – f/22 at 18mm there’s nothing in it. At longer focal lengths such as 85 – 135mm performance at the maximum aperture of f/5.6 shows the old lens is sharper at the centre but the new lens is more consistent across the frame with improved edge sharpness. There’s little to discern between the two lenses in terms of vignetting although, as we often see with Super Zooms, improvement at one end of the focal range is to the detriment of the other end. For example the new lens sees marginal improvement at 18mm using apertures ranging between f/5.6 – f/22. At wider apertures of f/3.5 – f/5.6 however the old lens performs better with fairly heavy shading encroaching into the frame on the Canon EF-S 18-135mm f3.5-f5.6 IS STM, something low-light photography enthusiasts should bear in mind. With a DxOMark Chromatic Aberration score of 10um compared to 9um the STM version fares slightly worse overall, but again the difference is marginal. At 18mm results are almost identical but zoomed in between 24 – 135mm the new lens isn’t as good towards the edges. Canon EF-S 18-135mm f3.5-f5.6 IS STM vs. Nikon AF-S DX 18-135mm f3.5-f5.6G IF-ED: Do either of the big rivals have the edge? If you’re in the market for an APS-C DSLR and a general-purpose lens then should either of the consumer Super Zooms from Nikon or Canon sway your decision? Tested on the flagship APS-C DSLRs from Canon and Nikon, the 7D and D7000, these two Super Zooms achieve remarkably similar results. Overall we can say they’re the same optically although the Nikon version hits a DxOMark Score of 13 just nudging out the Canon with 12. Examining the Scores further you’ll notice the lenses boast similar scores for Sharpness, Vignetting, and Chromatic Aberration with the Canon having a marginally better Transmission & Distortion score but there’s not much in it. Although the overall score for sharpness is similar each lens has its own strengths and weaknesses. With the aperture wide open at all focal lengths the Canon has the advantage with a more homogeneous performance across the frame compared to the Nikon, which, although sometimes sharper toward the centre, isn’t as strong at the edges. Both lenses perform poorly for image distortion with barreling evident at 18mm and pincushion between 24 – 135mm, both of which will need correcting in postproduction for a pleasing image. As indicated by the DxOMark Overall Chromatic Aberration Score both lenses surpass expectation in this regard. There is some default on the Canon, notably around 35mm with correction towards the edges necessary but at 18mm the Canon is more consistent across the frame. The Nikon tends to do better in the centre although it’s fair to say the Nikon controls Chromatic Aberration more consistently at different focal lengths with less peaks and troughs than the Canon. With a DxOMark Score of 12 the Canon EF-S 18-135mm f3.5-f5.6 IS STM achieves an excellent rating for an all-in-one Super Zoom lens. In terms of Sharpness the latest version just edges out its predecessor the Canon EF-S 18-135mm f/3.5 –f/5.6 IS to make it the sharpest Super Zoom on the DxOMark tested database. Updated from a previous version to include Canon’s new Stepper Motor for silent autofocus during video capture the DxOMark Scores indicate there’s no discernable difference in optical performance between the new and old versions. There are some minor differences, notably to Sharpness, but they aren’t significant and unless you really want or need the new Stepper Motor the old Canon EF-S 18-135mm f3.5-f5.6 IS version is just as good, still available and a little bit cheaper to boot.